What is this you say? Well, it's a close-up of the dressing on my leg. I couldn't let you actually see my leg, as it is badly in need of shaving, and I am not about to shave around the 2 incisions on my leg - too scary. Anyway, back to the story, when we bought dressing for the incisions the other day, we forgot to buy something to "adhere" it to my leg. So, I asked myself, "WWMD?" (What would MacGyver Do?) No need for paper clips here. 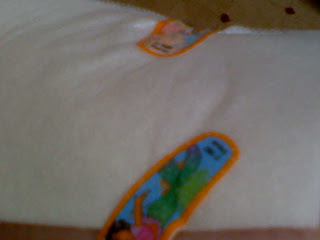 Thankfully, I found the Dora the Explorer Band-Aids from when my neices lived with me. Otherwise, I might have had to use the pink duct tape we bought to tape a trash bag over my leg so I could bathe. 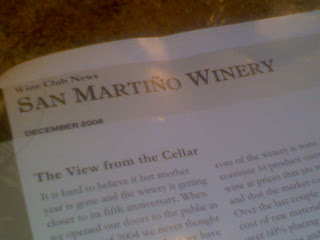 Being car-less, I was unable to pick up my quarterly wine "shipment" at San Martino in Rockwall in December. 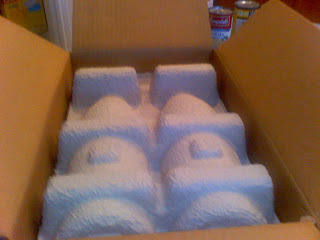 So, I requested to have my shipment actually "shipped" to me. Well, it arrived today. I received an automated call from UPS early this morning stating that I had a delivery and someone had to sign for it so please be available between 8am and 7pm. Good thing I'm not going anywhere. The Flyer that explains the wine! This cracks me up. 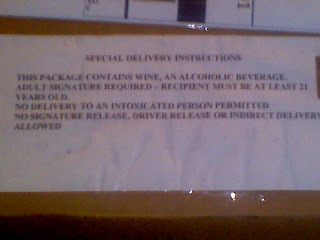 Please note the 3rd instruction : "No delivery to an intoxicated person permitted"
For some reason, this really strikes me funny. Do you think the UPS guy/girl ever comes across this? What happens if the intoxicated person gets belligerent because they can't get their fix? Do they have to call the cops? I think this is so cool. I am saving this packing so the next time I'm transporting 2 bottles of wine, I can make sure it arrives safely to my destination. WA-LAAAA!!! 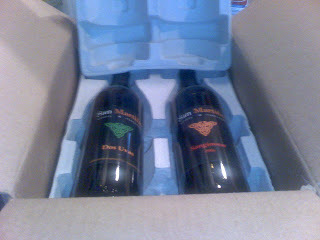 My wine... finally..... only 2 more weeks until the next quarterly shipment. So, I better get drinkin'! I have been washing my hair in the kitchen sink. I have my PC set up in the breakfast room. So, I have been drying my hair there because I couldn't stand up that long in the bathroom. So, since I didn't have a mirror, I thought to myself, "What would McGvyer do?" Of course, use the Webcam! I'm a freakin' genius. It's so obvious. Of course, it's not a perfect solution. 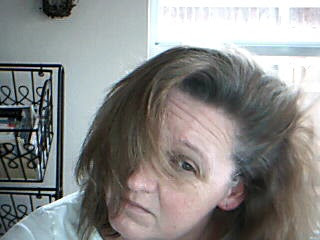 I can only see the front of my hair, and when I look in the webcam, the side I'm brushing is the opposite. It gets confusing.